Do you have questions about soft skills? Those elusive soft skills, you know they are important but sometimes they can be really hard to define. Just ask someone what “professionalism” means – and depending on the job role – you’ll get all sorts of answers. SkillSurvey and BambooHR have teamed up to answer the 20 most common (and critical) questions about soft skills in the workplace. What are the most important soft skills and why? How do soft skills impact employee performance and productivity? What other outcomes do soft skills impact? How do you identify (and record) soft skills in your current employees? Can you hold people accountable for soft skills? If so, how do you avoid subjectivity? 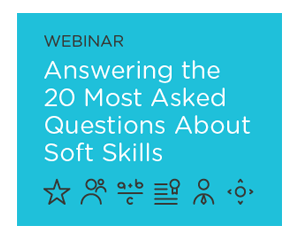 Watch this on demand webinar today and uncover the truth about soft skills.